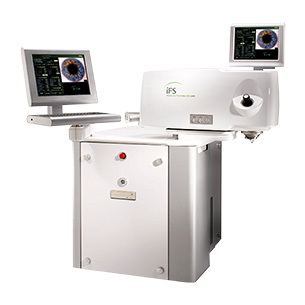 Hoopes Vision acquired the IntraLase femtosecond laser in December of 2003 and began performing blade-free LASIK, becoming the first practice in the Salt Lake City area to do so. In the summer of 2009, Hoopes Vision became the first Utah LASIK center to receive the newest upgraded version of IntraLase™ — the new iFS IntraLase™ laser. This completely redesigned fifth-generation laser offers many advantages over older forms of IntraLase. Creating a flap in as little as nine seconds for a faster procedure. Ability to make an inverted, bevel-in edge for the corneal flap. This modification allows the LASIK surgeon to tuck the edge of the flap underneath the periphery of the cornea rather than resting on top. This has been shown to create stronger flap adherence, with less chance of striae (wrinkles) post-LASIK. The corneal flap can be created in an elliptical shape which has shown added benefits for patients with astigmatism.